↑ 1,00 1,01 1,02 1,03 1,04 1,05 1,06 1,07 1,08 1,09 1,10 German National Library, Berlin State Library, Bavarian State Library et al. Record #11859964X // Gemeinsame Normdatei — 2012—2016. ↑ 5,0 5,1 5,2 Rembrandt Harmensz. van Rhijn — 2009. ↑ "Rembrandt" Archived 4 March 2016 at the Wayback Machine.. Random House Webster's Unabridged Dictionary. ↑ 11,00 11,01 11,02 11,03 11,04 11,05 11,06 11,07 11,08 11,09 11,10 11,11 11,12 11,13 11,14 11,15 11,16 11,17 Т. Каптерева. Рембрандт Харменс ван Рейн // Европейское искусство: Живопись. Скульптура. Графика: Энциклопедия. — М.: Белый город, 2006. — Т. 3. ↑ Rembrandt-signature-Պատկեր.com Archived 9 April 2016 at the Wayback Machine. ↑ Կամ հնարավոր է, որ 1607 թվականին, քանի որ 1634 թվականի հունիսի 10-ին նիր խոսթերով 26 տարեկան էր: Տես՝ Is the Rembrandt Year being celebrated one year too soon? One year too late? ↑ Доброклонский М. В. Рембрандт, Харменс ван Рейн // Большая советская энциклопедия / Гл. ред. С. И. Вавилов. - 2-е изд. - М.: Сов. энциклопедия, 1965. ↑ Erhardt, Michelle A., and Amy M. Morris. 2012. Mary Magdalene, Iconographic Studies from the Middle Ages to the Baroque. Boston : Brill. p. 252. 9789004231955. ↑ Slive has a comprehensive biography, p.55 ff. ↑ Berger, Harry. Manhood, Marriage, & Mischief: Rembrandt’s 'Night watch' and other Dutch group portraits. - Fordham University Press, 2007. ISBN 0-8232-2557-7. Page 177. ↑ Art in the Making: Rembrandt. - Yale University Press, 2006. Page 189. ↑ Art of Northern Europe, Institute for the Study of Western Civilization. Archived 29 September 2007 at the Wayback Machine. ↑ Useful totals of the figures from various different oeuvre catalogues, often divided into classes along the lines of: "very likely authentic", "possibly authentic" and "unlikely to be authentic" are given at the Online Rembrandt catalogue Archived 13 May 2012 at the Wayback Machine. 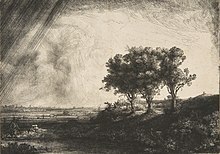 ↑ It is not possible to give a total, as a new wave of scholarship on Rembrandt drawings is still in progress — analysis of the Berlin collection for an exhibition in 2006/7 has produced a probable drop from 130 sheets there to about 60. Codart.nl Archived 27 May 2016 at the Wayback Machine. The British Museum is due to publish a new catalogue after a similar exercise. ↑ See Schwartz, 1994, where the works are divided by subject, following Bartsch. ↑ While the popular interpretation is that these paintings represent a personal and introspective journey, it is possible that they were painted to satisfy a market for self-portraits by prominent artists. Van de Wetering, p. 290. ↑ Catherine B. Scallen. 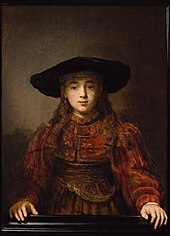 Rembrandt, Reputation, and the Practice of Connoisseurship. - Amsterdam University Press, 2004. ISBN 90-5356-625-2. ↑ Kristin Bahre u. a. (Hrsg. ): Rembrandt. Genie auf der Suche. - DuMont Literatur und Kunst, Köln 2006. Seite 208. ↑ «Наука и жизнь», № 12, 2011, стр. 66. ↑ Schama, Simon (1999). Rembrandt's Eyes. Knopf, p. 720. ↑ "...Rembrandt was not always the perfectly consistent, logical Dutchman he was originally anticipated to be." Ackley, p. 13. ↑ van de Wetering, p. x. ↑ Alison McQueen. The Rise of the Cult of Rembrandt: Reinventing an Old Master in Nineteenth-century France. - Amsterdam University Press, 2003. ISBN 90-5356-624-4. ↑ Рембрандт ван Рейн // Энциклопедический словарь Брокгауза и Ефрона : в 86 т. (82 т. и 4 доп.). - СПб., 1890-1907. Van De Wetering, Ernst (2004) (2nd paperback printing in 2016). The Painter At Work. University of California Press, Berkeley and Los Angeles. University of California Press, London, England. By arrangement with Amsterdam University Press. 0-520-22668-2.